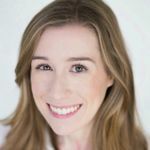 When you’re researching unique wedding venues in Seattle, looking at ideas from real couples can help to inspire your own big day. We've rounded up some of our favorite Seattle wedding venues that we believe stand out from the rest, but don't just take our word for it — take a look at how actual couples used these cool venues to bring their dream weddings to life! Start planning your one-of-a-kind celebration with these unique wedding venues in Seattle. Does anything sound more charming than the thought of getting married at a blueberry farm? We don’t think so. 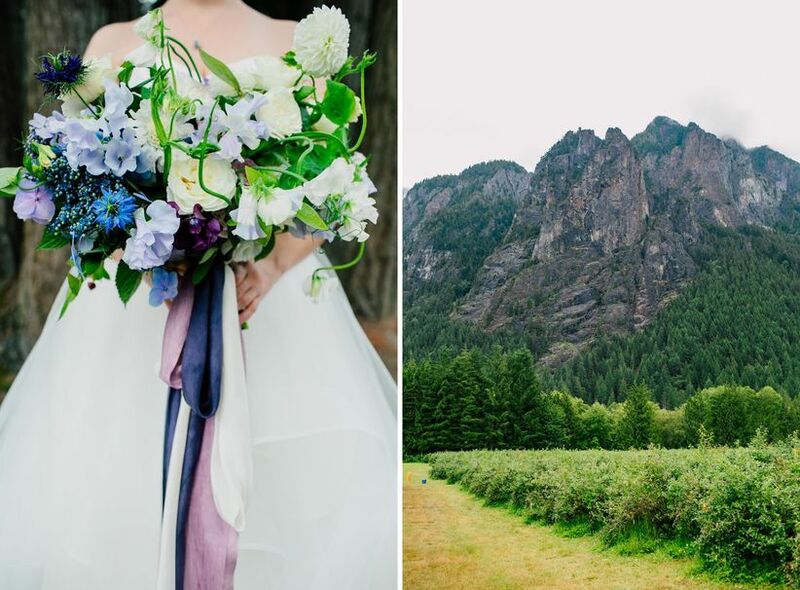 This idyllic wedding venue in North Bend is less than an hour’s drive from downtown Seattle and is one of the most perfect places for outdoor-loving couples. Bybee Farm offers incredible scenic views for a beautiful wedding — the venue’s built-in altar is quite literally at the foot of a mountain! The family-owned farm hosts just 12 weddings a year (and only during the summer season), making it one of the most exclusive Washington State wedding venues. 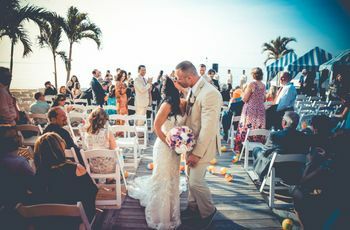 In our opinion, the best part is that you can return to the venue each summer to pick blueberries and relive your wedding memories all over again. By keeping the overall decor simple, you can put the focus of your big day on the farm's gorgeous location. 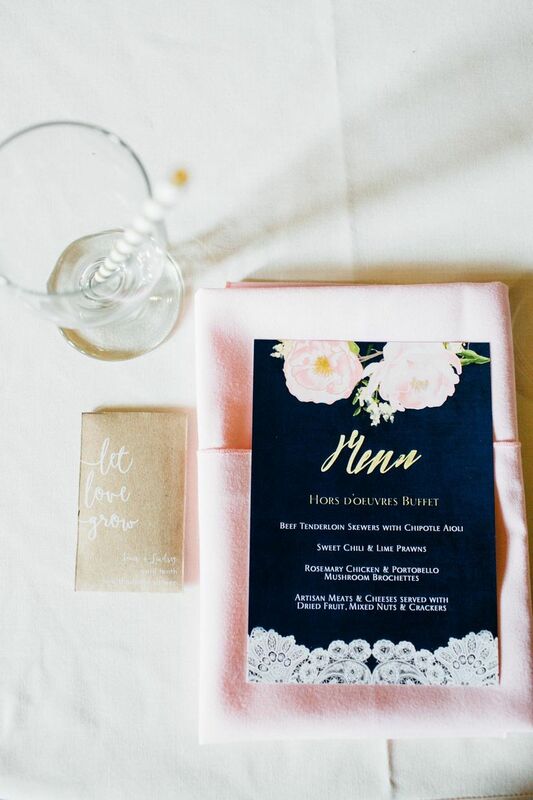 Consider incorporating blueberry-inspired hues, like navy blue, light blue and purple, for your wedding color palette as a nod to the venue. 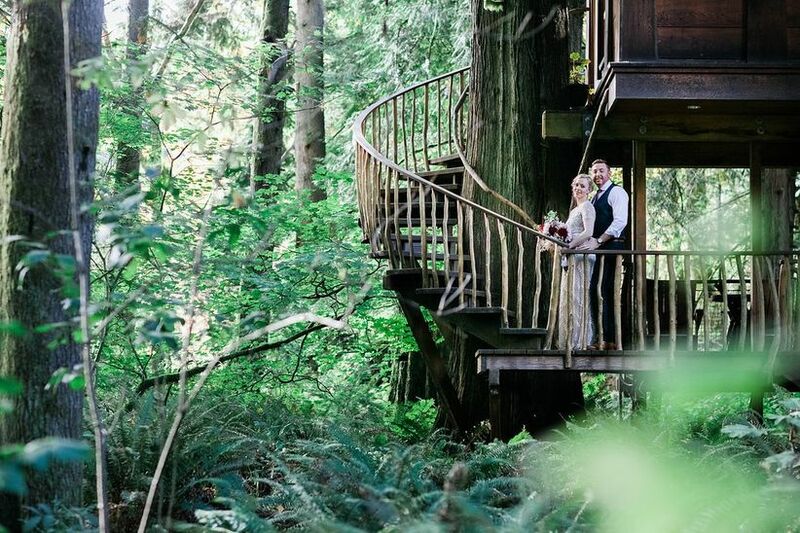 If the idea of getting married in the treetops of Washington’s forests sounds like heaven to you, then you’ll want to visit TreeHouse Point in Issaquah. 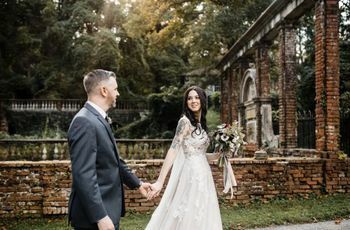 This venue has not one, but six different tree houses to choose as the backdrop for your ceremony. 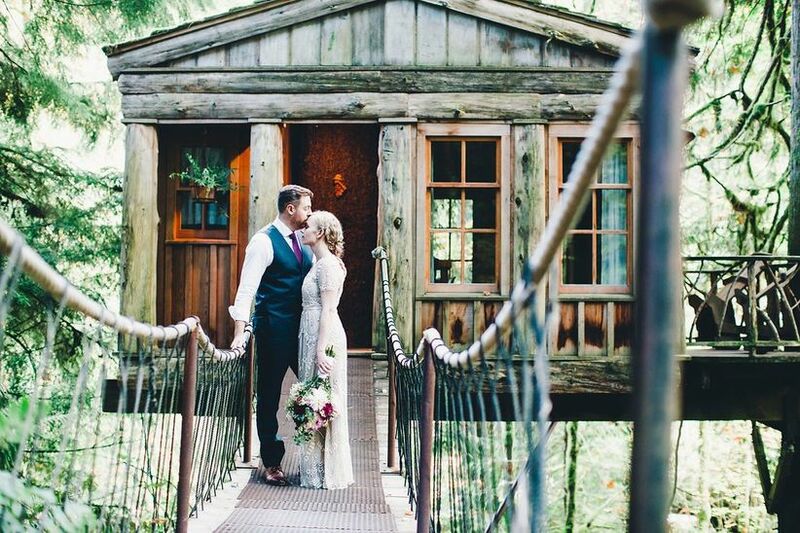 TreeHouse Point is best for elopements and smaller Seattle weddings, but the property guarantees a one-of-a-kind experience no matter what your wedding size. 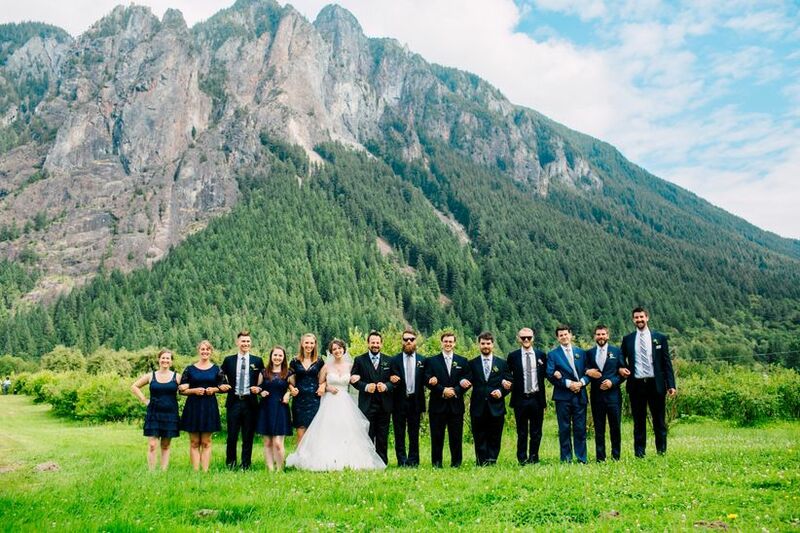 With the rental fee, you have exclusive use of the four-acre property for up to 22 hours (a rarity, even when it comes to unique wedding venues in Seattle). To help make your planning process as seamless as possible, TreeHouse Point offers wedding packages and vendor recommendations. The best part? You won’t have to book a hotel room, since you can stay at the venue overnight. This romantic treehouse is a gorgeous location for couples who love the forest wedding trend. Keep your wedding attire simple and practical to stay comfortable throughout the day as you meander through the treetops. 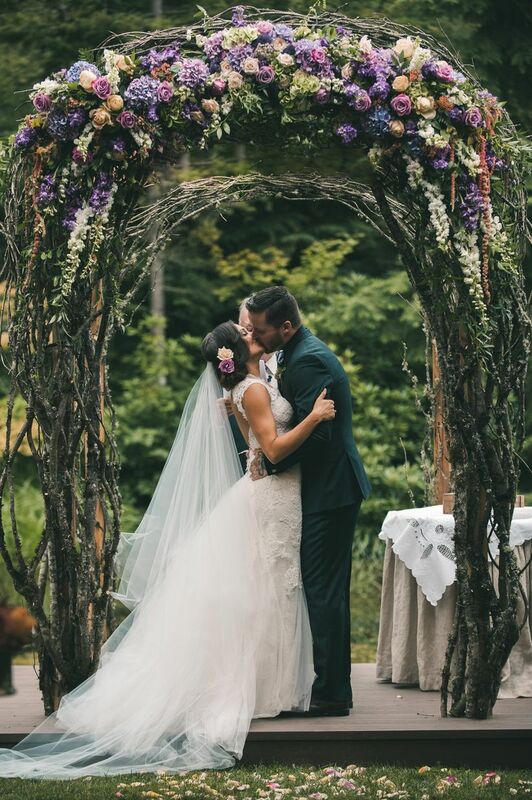 Located just 20 minutes northeast of downtown in Bothell, this rustic chic property is one of our favorite unique wedding venues in Seattle. The Loft at Russell’s is a refurbished barn that was first built in 1927. 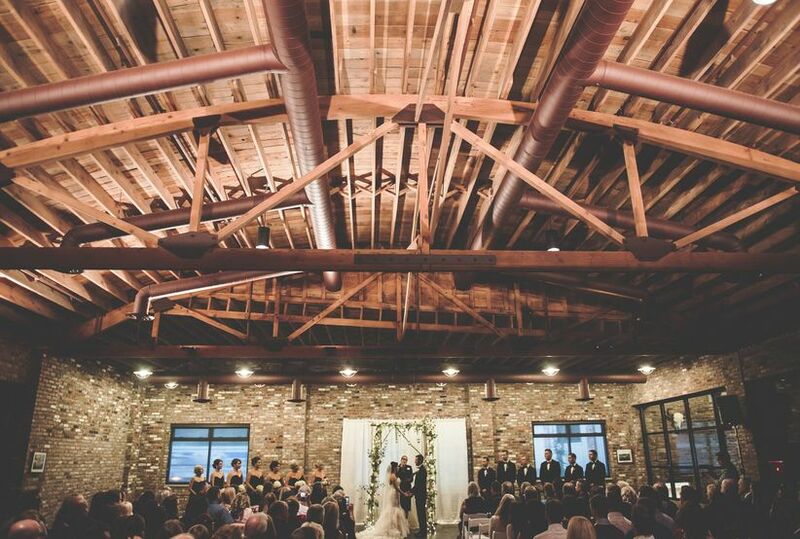 While the first floor of the barn houses Russell’s Restaurant, the loft has 4,000 square feet of event space with original hardwood floors, cathedral-style ceilings and strand lights adorning the rafters. All catering and bartending is provided in-house by the Russell Lowell Catering staff. 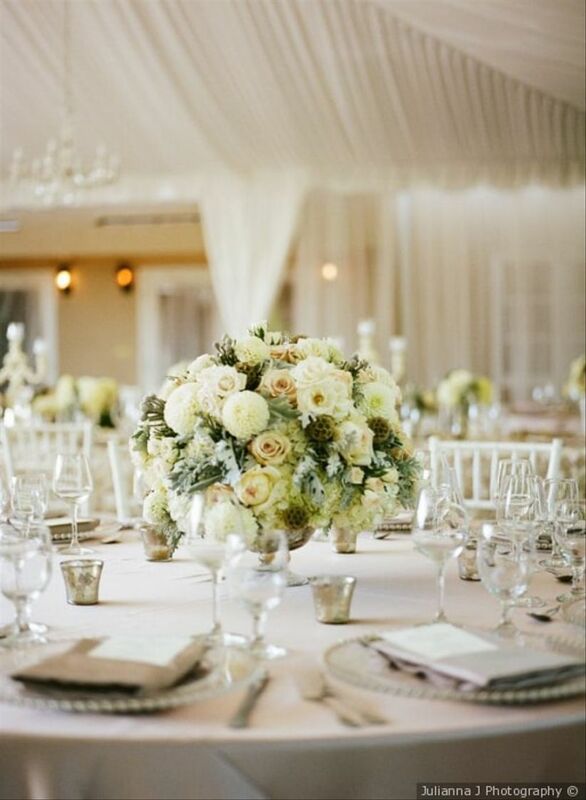 The venue can accommodate weddings with up to 180 guests and will supply linens, tables, chairs, and china. 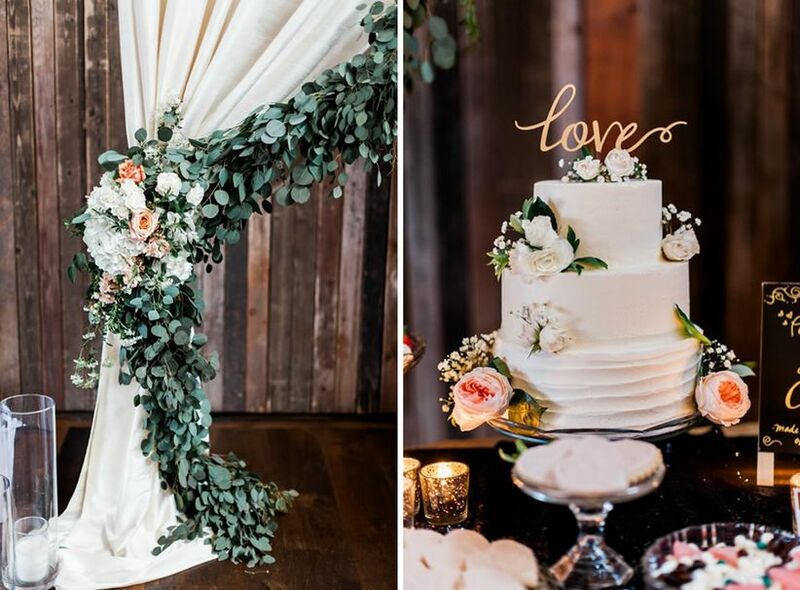 A combination of ethereal and rustic styles will complement this Seattle wedding venue perfectly. Incorporate details like greenery, white fabric arches, and hints of blush pink to enhance the natural wood and natural light in the loft space. 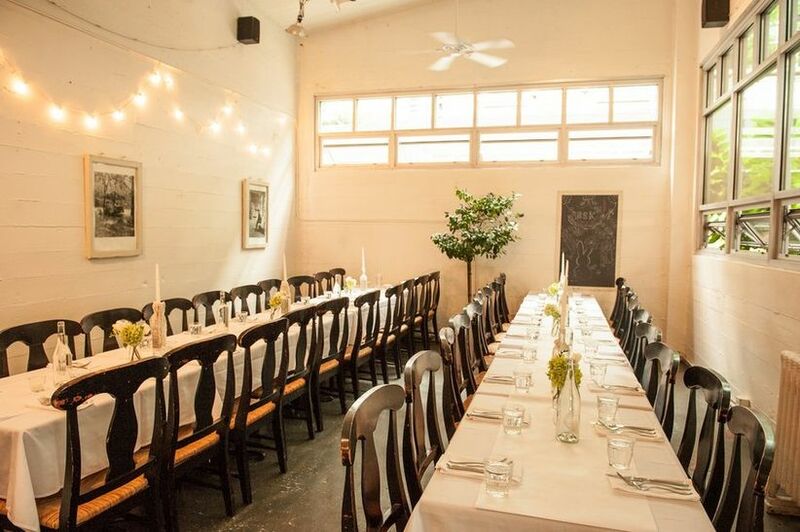 This central Seattle restaurant is perfect for couples who want to host a more intimate and low-key wedding reception. Boat Street Kitchen & Bistro is an excellent choice if you’re more concerned about treating your guests to a hearty meal than having an all-night dance party (although you can definitely dance here, too!). The bistro specializes in French-inspired dishes and uses local and organic ingredients whenever possible. You’ll feel right at home thanks to the restaurant’s cozy, semi-rustic style — think whitewashed walls and industrial-inspired details (steel ceiling fans, bistro lights, exposed pipes). 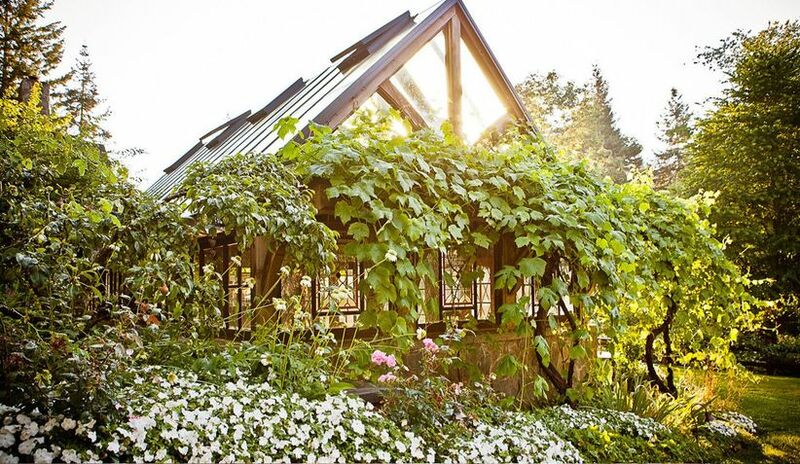 This unique wedding venue in Seattle is perfect for smaller weddings with 50 or fewer guests. 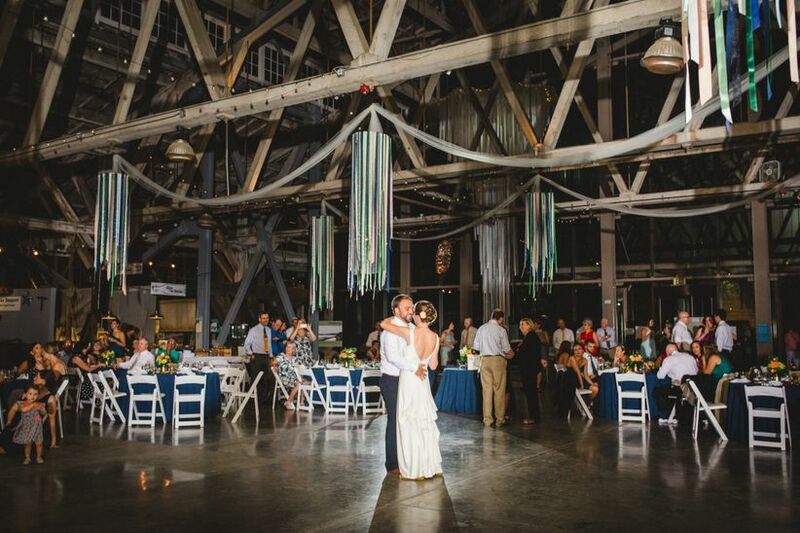 The industrial details of this unique wedding venue in Seattle will do the hard work for you, meaning you won't need a lot of decor to fill the space. Keep the overall look elegant and effortless with candles, minimal centerpieces, and a touch of greenery to freshen up the dining room. History buffs will love this waterfront Tacoma venue. The Foss Waterway Seaport is a collection of historic buildings, museums and exhibits showcasing Tacoma’s maritime past. 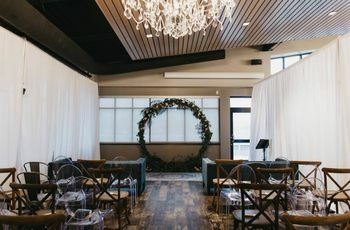 The venue’s main exhibit hall is one of the most memorable and unique spaces in Washington, with 55-foot ceilings and a window wall that provides plenty of natural light and unbeatable views of Commencement Bay. 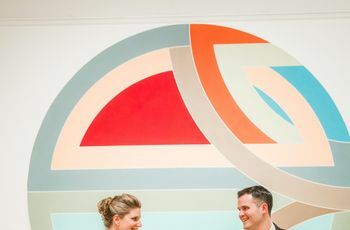 Your guests will love exploring the museum’s artifacts and exhibits that are housed in the main hall, or they can venture outside to the venue’s esplanade for a closer look at the water. With its waterfront location, this Washington State wedding venue is a natural fit for anyone thinking of having a nautical wedding theme. Decorative touches like sailing rope, vintage hurricane lanterns, and fishing net will play into the venue's maritime feel. Old meets new at this refurbished lodge in Tacoma. Historic 1625 Tacoma Place is located in Central Tacoma (near the museum district), which is an easy 40-minute drive from downtown Seattle. If you love the industrial wedding decor trend as much as we do, then you’ll appreciate this venue’s urban characteristics, such as brick walls, vaulted ceilings, slate floors, and Edison bulb lanterns. The venue’s collection of American-made muscle cars is what sets it apart from other Seattle wedding venues — you can even include a viewing of the collection in your wedding package if you or any of your guests are vintage car enthusiasts. 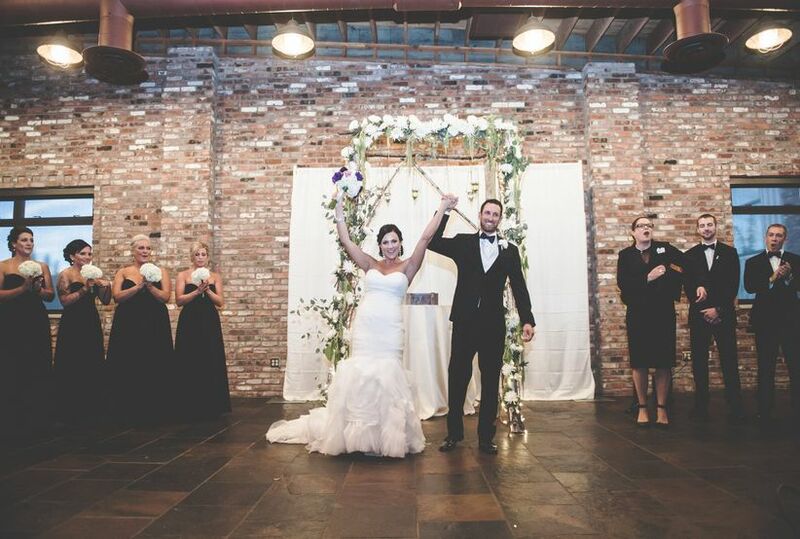 The stately Trophy Room at Historic 1625 Tacoma Place can accommodate up to 350 guests, with enough space for a dance floor, tables and bar (all provided by the venue). Formal and industrial wedding styles may seem like total opposites at first, but when you combine them, the end result is actually quite chic. Exposed beam ceilings and brick walls give a bit of edge to traditional wedding decor such as crystals, chandeliers, and pintuck linens. 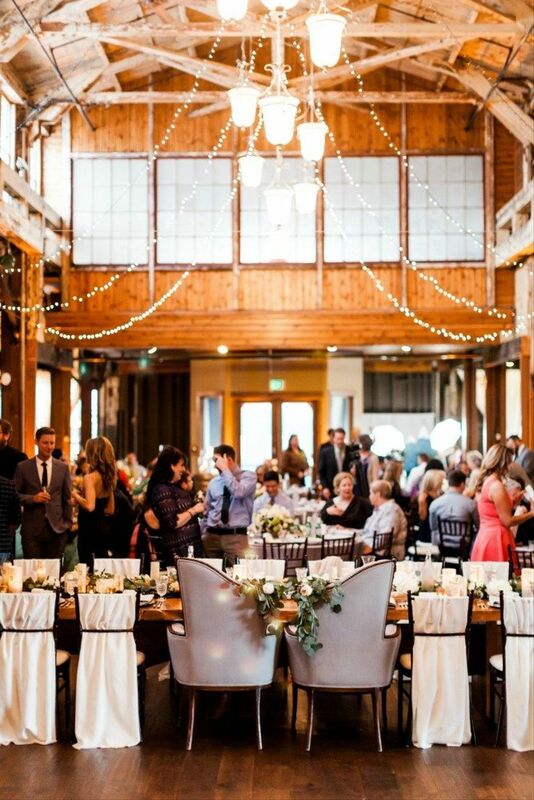 When it comes to unique wedding venues in Seattle, you can’t beat this rustic chic spot in the historic SoDo District. 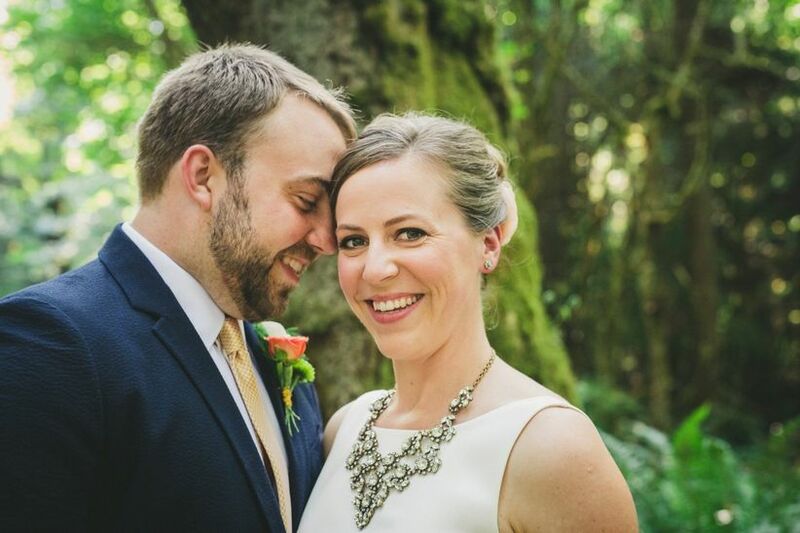 Sodo Park is a perfect choice for couples who don’t want to sweat the small stuff — this full-service venue takes care of all the necessary wedding planning details for you. Catering, beverages, event coordination, tables, chairs, and china are all included with your rental fee, courtesy of Herban Feast Catering. Event styling, floral design and decor rentals are all optional add-ons provided by the Herban Design Studio. 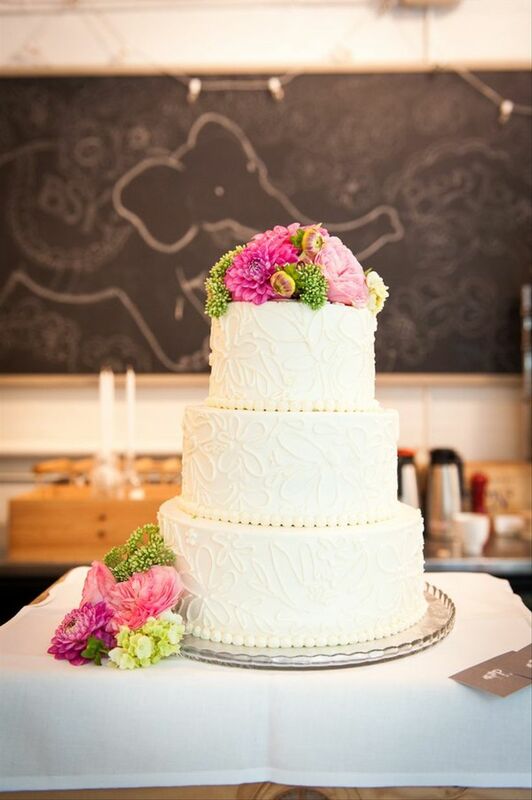 Sodo Park is one of our favorite downtown Seattle wedding venues and can host seated receptions for up to 325 guests. 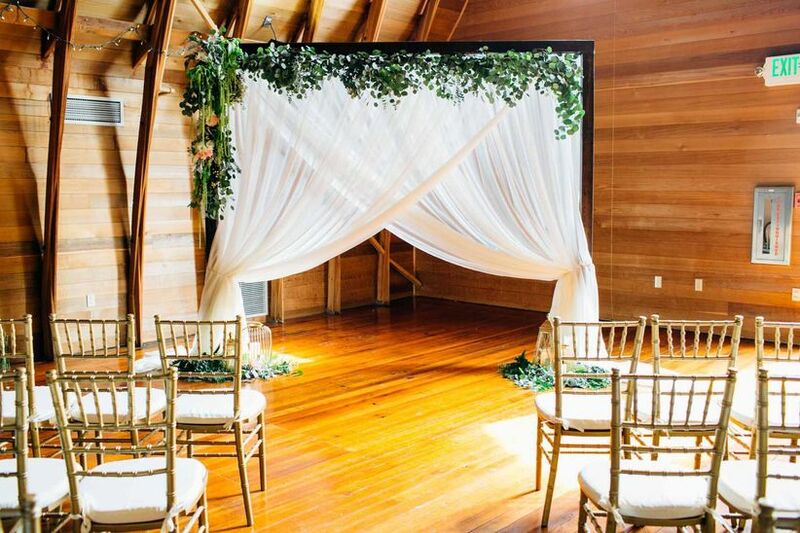 Lush greenery and flowers will soften the overall rustic feel of this venue. Metallic details and candle decor will help transform the space into an ultra-romantic setting. European-inspired buildings and quaint, one-of-a-kind details are what set this farm venue apart from other rustic Seattle wedding venues. Bella Luna Farms in Woodinville is full of romance and country charm, and we’re not kidding when we say that this venue looks like something straight out of a fairytale, like Belle’s house in Beauty and the Beast or the cottage from Snow White and the Seven Dwarfs. On the 12-acre farm, you’ll find goats, chickens, an apiary, multiple gardens, and a duck pond. 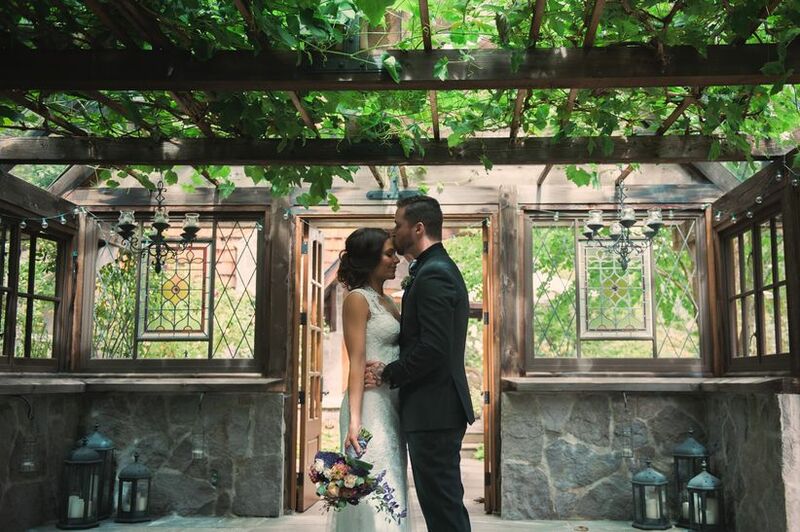 For your cocktail hour or reception, we personally love the adorable Grape House, which is a vine-covered room with skylights, stained glass windows and stone floors. The venue’s two-story barn is a popular spot for your wedding photos, thanks to a unique lookout balcony on the top floor. Our motto: when in doubt, add more flowers. Bella Luna Farms is beautiful enough on its own, but decorative elements like oversized floral arrangements and floral-inspired signature cocktails will only add to the enchanted garden theme. You don’t have to travel all the way to France to get married at an elegant château. DeLille Cellars in Redmond is a boutique winery with Bordeaux-style architecture and 10 acres of land, making it one of the most beautiful and unique venues in Seattle (not to mention a perfect location for a wine-themed wedding). For indoor weddings, the venue’s Grand Room features vaulted ceilings and French country style accents, such as brass chandeliers, wine barrels, candelabras, and a giant hearth. 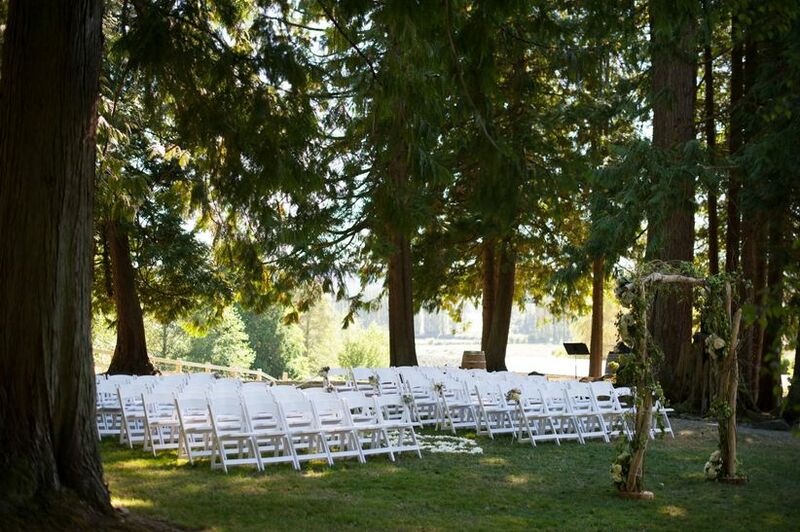 The estate’s tree-lined lawn is a private and romantic setting if you want to get married outside. This wedding venue was made for hosting timeless events. Accent a soft color palette of ivory, beige, and olive green with details like chandeliers, pipe and drape, and silver pieces.